Our engineering firm specializes in materials handling and general fabrication across a variety of industries. Our trolley rail systems are designed to transport hung garments quickly and efficiently. 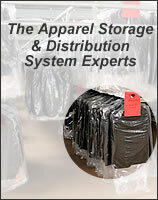 They increase warehouse capacity and reduce operating costs.